An artist impression of Bintulu Jepak Bridge. KUCHING: Cahya Mata Sarawak Bhd’s (CMS) first Coastal Road job is a sign of more to come as analysts believe that the group will stand to benefit from more upcoming infrastructure projects across Sarawak. Of note, on Wednesday, CMS announced PPES Works (Sarawak) Sdn Bhd (PPES Works) and China Communications Construction Company (M) Sdn Bhd (CCCC) joint venture, PPES Works CCCC JV Sdn Bhd (PPES Works CCCC JV) received and accepted a Letter of Acceptance from the Sarawak State Government for ‘Package 05: Proposed Construction And Completion Of The Proposed Bintulu – Jepak Bridge’ crossing Kuala Kemena, Bintulu Division for a contract sum of circa RM467 million. According to its press statement, the agreement stipulates that the iconic bridge crossing Batang Kemena at Bintulu – Jepak is expected to be approximately 1,048 metres long with a four-lane double carriageway, and a cable-stayed bridge complete with a flyover over Jalan Tun Ahmad Zaidi, Jalan Tun Razak and the Jalan Abang Galau traffic junction, with an approximate four-kilometre connecting road. “The awarding of this package signals the Sarawak State’s commitment for the Sarawak Coastal Road to take off. 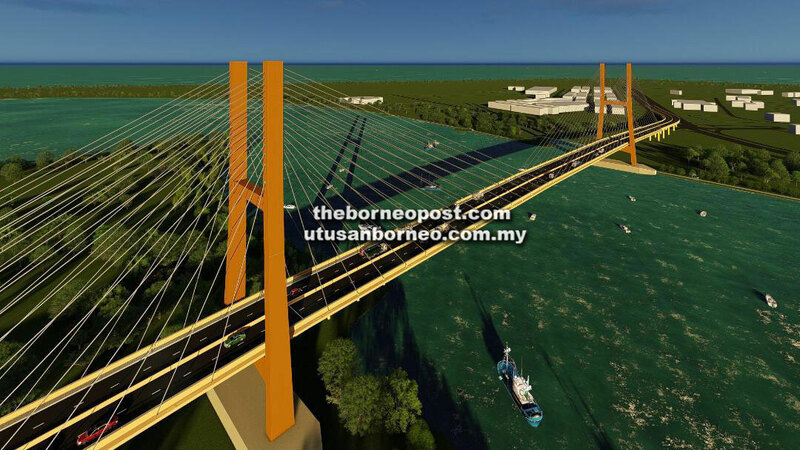 “With a slew of bridges expected to feature in both the Sarawak Coastal Road and Second Link Road, CMS will also benefit as the sole cement and major building materials supplier within the state,” the research team at Maybank Investment Bank Bhd (Maybank IB Research) remarked. This contract is the first announced on Bursa Malaysia by CMS in 2019 and has brought its year to date job win to an estimated RM327 million (based on PPES’ 70-per cent stake in the JV), the research team said. “Assuming an eight per cent pretax margin, we estimate a net profit contribution of RM10 million (based on CMS’ 51 per cent stake in PPES) into FY23E,” it added. Having only assumed RM150 million of job wins for FY19, the research team raised its job win assumption to RM600 million, with CMS still vying for a package from the Second Link Road. “As a result, our FY19 to FY21 estimated earnings are marginally increased by one per cent each,” it added. Meanwhile, MIDF Amanah Investment Bank Bhd’s research arm (MIDF Research) noted that the Bintulu-Jepak bridge is one of the four bridges planned for construction in Sarawak. “The others are Muara Lassa Bridge in Mukah, Rambungan Bridge in Lunde, and Batang Lupar Bridge in Samarahan-Betong,” it said, noting that the Coastal Road project involves the construction of 11 bridges with the main components are Btg Saribas bridge, Btg Rajang bridge, and Sungai Krian bridge. “We favour CMS for its encouraging prospect in Sarawak. The pending roll-out of the state infra projects will stimulate further optimism on the stock, while enabling CMS to improve its core earnings. “We opine CMS is in the position to benefit given its extensive value chain and strong presence advantage. “In the meantime, we opine further progress of PBH will benefit CMS in the form of sustainable earnings accretion in the near term,” it said. To note, PPES Works is a 51 per cent-owned subsidiary company of CMS with the remaining 49 per cent equity interest held by Sarawak Economic Development Corporation. Overall, both MIDF Research and Maybank IB Research maintained its favourable ‘buy’ call on the stock.